Hi everyone! It’s time for the July My Favorite Things Creative Constructions with Blueprints posting. Today, the Design Team is featuring birthday tags using the Tag Builders Die-namics! It’s not a typical birthday tag because there are no balloons or any "Happy Birthday" sentiment on it. But with the bright and festive colors plus the sentiment, this could be a great add to embellish a birthday package (especially for cat or animal lovers). I used the Blueprints 2 - Tag Builder Die-namics set. I created the background sky with some die-cuts from the Die-namics Clouds Cover-Up plate that I sponged with Blue Breeze dye ink. 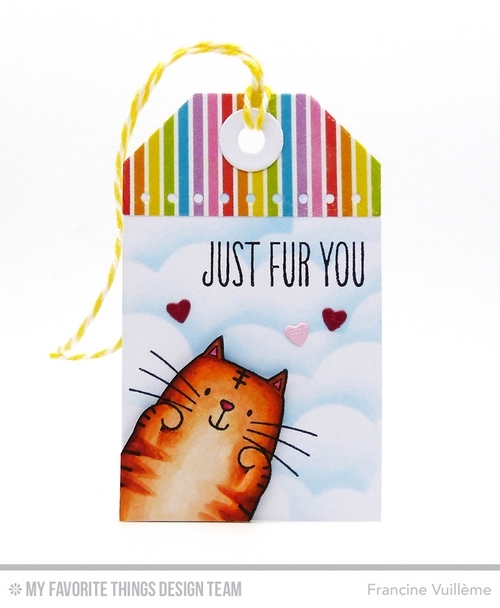 The sentiment and the fun cat are from the Birdie Brown I knead you stamp set. Be sure to check the MFT blog for more inspiration and projects from the Design Team featuring the Tag Builders! Oh nein, wie süss ist denn die Katze bitte ? Tolles Tag ! Das Set ist gerade auch bei mir neu eingezogen und daher bin ich dir doppelt dankbar für deine Inspiration. Du hast die Katze grandios coloriert, ich bin begeistert. Fun and so super cute!! You made such a cute tag! !